Perhaps Laurence Olivier is such a mythical figure that one takes him for granted. But his virtuosity was once again confirmed in a recent screening of his 1948 Hamlet at the The NewYork Psychoanalytic Institute. Ernest Jones wrote a classic tome entitled Hamlet and Oedipus , and no matter what philosophical or psychological filter one applies to Olivier's classic performance—whose greatness, like the Mona Lisa’s smile, lies in ambiguity itself—the subject of the so-called Oedipus complex is an unavoidable theme, making a psychoanalytic institute the perfect venue for such a revival. Stanley Holloway stands out in particular as the gravedigger, presiding over his little kingdom from the floor of Ophelia’s grave and offering the measurements of death itself. Heidegger claimed that the awareness of death was crucial to living an “authentic” existence, and this scene, more than any modern treatment of the dying process, tries to take the hereafter into account in the most empirical way possible. About Ophelia, the gravedigger says, "One that was a woman, sir, but rest her soul, she's dead." 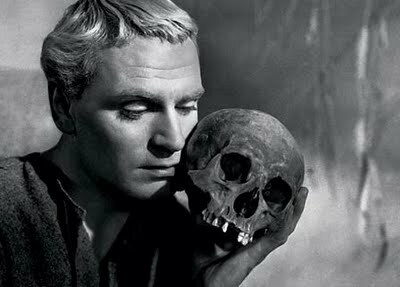 Ironically, later, in trying to explain his rash actions to Laertes, Hamlet attributes the loss of his self to madness. Foucault wrote a book called Madness and Civilization , but a good subtitle for the Olivier Hamlet, and the way it emphasizes the extinction of personality, could be Madness and Death.